Acho....The one and only Real Murcia....Pijo! : Real's second Englishman : The GIF! 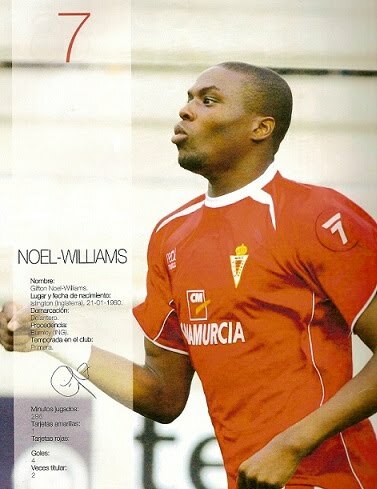 Following on from Real Murcia's first english player Thompson , our second(and last) english player was Gifton Noel Williams. Noel Williams arrived on 31st January 2007, the last day of the transfer window, from Burnley. He had previously been at Watford and Stoke City. Gifton waited patiently on the bench for a few weeks for his opportunity. Real Murcia were having a good season, were always in the top 3. I met Gifton on his first day in Murcia, helping a pal of mine (an estate agent) to show him and his wife some housing, acting as translator. He asked me about the fans in Murcia, and I told him straight - "they are demanding and all too quick to make judgement. Miss-control you first pass or blast your first chance over the bar, and they will not let you succeed, you will be marked, and will carry a cross until you leave. Make sure your first touch in a Real Murcia shirt is a good one". Gifton's chance finally came away to Alaves on the 3rd of March (just 9 minutes), but his home debut and real impact didn't come until the 24th of March, at home to Sporting Gijón, replacing Aranda for the last 6 minutes. His first touch was great control and a pinpoint through ball to a collegue, who missed the one on one chance. Gifton then scored a home debut goal just a minute later. Despite this, his chances were limited, coming on as a late substitute in a few games. His next goal came in the 3 - 0 home win over Xerez. His fourth and final goal for Real came on 27th May away at Malaga in a 2 - 1 win. In total he only played a total of 286 minutes....and I think his goals to minutes ratio is the best ever for a Real Murcia player. A good lad, a joker in the dressing room, missed a good curry (I solved this for him), enjoyed the odd cigarette, and was very competitive at everything, even card games with no money involved! Gifton told me something about really enjoying the good times, as you never know what is around the corner, and you can take things for granted. He came to Murcia as a centre forward, good header of the ball.....but this wasn't his natural game. He had plenty of baggage in knee problems, and had to adapt his game due to a certain lack of mobility. At Watford (he came through the youth ranks at the hornets), he had pace and skill. He finished top scorer.....he told me they had Chelsea and Arsenal looking at him, he felt like he was on the crest of a wave....then, a magic goal against Sunderland descibred thus in the press...."The winning goal was quite stunning. Ben Iroha's long throw into the box was controlled on his chest by Gifton Noel-Williams. With his back to goal and a defender in close attention, we waited for the lay-off to a colleague. Instead, in a moment of absolute genius, he hooked the ball goalwards over his shoulder as it dropped. The element of surprise was enough - Sorensen could do nothing, watching in astonishment with the rest of us as it bounced inside his right hand post, and Gifton was away to the corner flag to celebrate. An improvised masterpiece". Just a few minutes later, in the same game, Sunderland defender Paul Butler made a lunge that did for Gifton's knee....a horrendous injury, which took him almost 2 years to recover from (although he never really did recover, given the arthritis he suffered from). Pity he had to spoil his almost cult hero status at Murcia by signing for Elche (only joking) when then coach Lucas Alcaraz decided he was surplus to requirements for the 07/08 season in primera. After Elche he went to the USA, and now coaches in Austin, Texas.